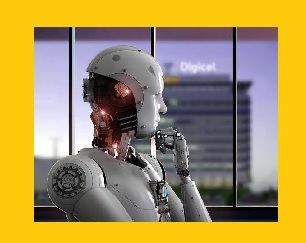 ROAD TOWN, Tortola, VI - Today, May 17, 2018, on World Telecommunication and Information Society Day (WTISD) being commemorated under the theme, “Enabling the positive use of Artificial Intelligence (AI) for all”, Digicel is affirming its commitment to using the futuristic technology for the benefit of all. The total communications and entertainment provider is raising awareness about how the future driven by AI will lead to the development of smart homes, smart cities and digitally-driven societies. AI is an area of computer science that enables machines to perform tasks normally requiring human intelligence - such as face and voice recognition, decision-making, and translation between languages. Examples include: a computer that has beaten a world chess champion and one that understands voice commands on a smartphone. And with new discoveries every day, the possibilities are endless. In anticipation, Digicel is constantly investing in future-ready data networks that are capable of ushering in this new wave of innovation and digital transformation. AI is also helping Digicel to put its customers more in control by improving digital self-care options, making menus more responsive to voice commands, especially for the visually challenged to navigate, and upgrading the My Digicel app to provide easy-to-use options for the hearing impaired. World Telecommunication and Information Society Day (WTISD) is celebrated annually by the International Telecommunications Union (ITU) on May 17. As a member of the global telecoms body, Digicel joins more than 700 organisations around the world in commemoration. Will not stop until we destroy ourselves. Self-destructive GMHs (Geneticly Modified Humans). Creations will never allow it’s true essence to be destroyed by the likes of an artificial adoption of itself. Carry-on. The global agenda of mass control. Including- human depopulation on the Earth. towards a perfect world right. Not! AI, CERN, Cloning, GMO, etc., by man...will never replicate the codes of the natural matrix. Natural life is cyclical. Destroy where excessive pollution occur and replace again with dormant code germination. Ninety seven percent (97%) of well programmed human beings will not innerstand these dynamics at play by their masters of illusion. It’s Great y’all thinking bout Future but what happen to the future internet service? Is it smart enough to fix our screwed up internet service? No? Then how will it fix the world? When Digicel start to give people better internet price than they can talk until than I don't want to hear them .